Yurihonjō (由利本荘市, Yurihonjō-shi) is a city located in Akita Prefecture, in the northern Tohoku region of Japan. As of May 2015, the city has an estimated population of 79,935 and a population density of 66.1 persons per km². The total area was 1,209.60 square kilometres (467.03 sq mi). Yurihonjō is located in southwest corner of Akita Prefecture, bordered by the Sea of Japan to the west, and by Yamagata Prefecture to the south. It is the largest municipality in Akita Prefecture in terms of area. Part of the city is within the borders of the Chōkai Quasi-National Park. Yurihonjō has a Humid continental climate (Köppen climate classification Cfa) with large seasonal temperature differences, with warm to hot (and often humid) summers and cold (sometimes severely cold) winters. Precipitation is significant throughout the year, but is heaviest from August to October. The area of present-day Yurihonjō was part of ancient Dewa Province, dominated by the Mogami clan during the Sengoku period. Under the Tokugawa shogunate, part of the area came under the control of Honjō Domain, Kameda Domain and Yashima Domain, with a very small portion under direct rule by the shogunate (tenryō). After the start of the Meiji period, the area became part of Yuri District, Akita Prefecture in 1878. The modern city of Yurihonjō was established on March 22, 2005, from the merger of the city of Honjō, and the towns of Chōkai, Higashiyuri, Iwaki, Nishime, Ōuchi, Yashima and Yuri (all from Yuri District). Just after the merger, the new city of Yurihonjō had 126 representatives in its new city assembly, more than the whole of Tokyo. The economy of Yurihonjō is based on agriculture and commercial fishing. Yurihonjō has 15 elementary schools, 10 middle schools and five high schools, as well as one special education school. Akita Prefectural University also has a campus in the city. Amasagi Village is a complete tourist center in the town of Iwaki, northern Yurihonjō. It is centered on an historical facility, and it contains the samurai residence of the Unuma family (transferred from its original site), and a museum with collections of furniture and samurai armor. A large standing Buddha statue. Each year a large cherry blossom festival (April) and Azalea festival (May) take place here. This park is famous for its yellow cherry blossom trees and it holds a firework display in May during full bloom. One of Japan's Top 100 Waterfalls, grassy park, and hiking trails in the mountains near Mt. Chōkai. One thousand stone statues line the side of a hill in Oriwatari, Ōuchi. These statues wear a red bib, representing jizō. A small but popular ski area on the lower slopes of the Mount Chōkai. It is especially popular with snowboarders. 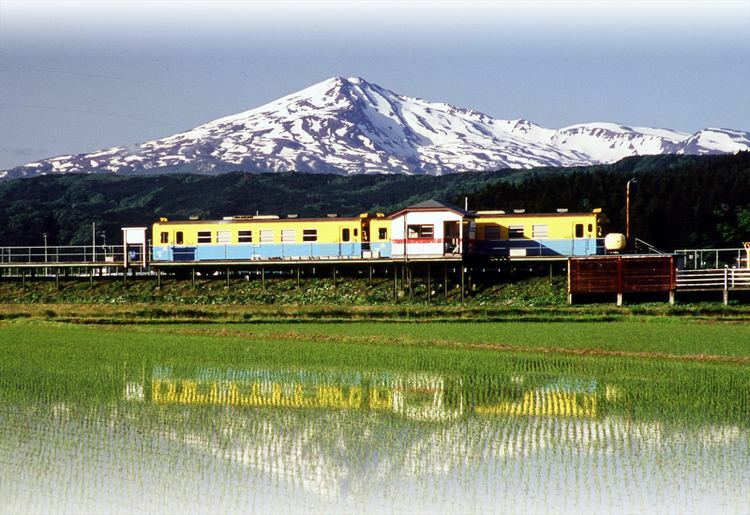 A large plateau of outstanding natural beauty on the Akita side of Mount Chōkai. It includes numerous rental cottages and an amusement area. Taki Hot Spring (滝温泉, Taki Onsen) in the Ōuchi area is reputed to cure minor pains and many sufferers stay there long-term. There are 500 metre & 1000 metre rowing courses at the mouth of the Koyoshi River. A major public regatta takes place here each year in September. Three high schools in Yurihonjō have their own rowing clubs with a history of success in national rowing championships. Honjō has a wide beach with an adjacent yachting harbour. A fireworks festival is held every summer near the mouth of the Koyoshi River. This religious event takes place in January in which a group of men and boys walk up the Shinzan mountain through the snow to Shinzan Shrine. They wear only loincloths and thin shoes. In March each year visitors can follow a map of public displays of the traditional Hina dolls at over 50 different locations around the city. Mount Chōkai (鳥海山, Chōkai-san) is an inactive volcano that stands alone on the border between Akita Prefecture and Yamagata Prefecture. It is 2,236m high and is the second highest mountain in the Tohoku area. It is popular with skiers, hikers and climbers. There are two main trails for climbing Mount Chōkai from the Akita side. One trailhead is in Nikaho, south of Yurihonjō. The other, in Yurihonjō, starts at the Haraikawa (秡川) Parking Area. A one-way hike from the Haraikawa commonly takes 3 hours and there are bungalows and camping sites on the lower slopes of this trail. The mountain has its own unique Alpine plants and vegetation such as Chōkai Thistle (チョウカイアザミ) and Chōkai Fusuma (チョウカイフスマ). There are four independent sake breweries in Yurihonjō: Akita Homare, Yuri Masamune, Tenju, and Dewanofuji. Dried noodles which are eaten hot or cold. The texture of Honjō Udon is tough. These elaborate decorative balls are made from silk thread and are a popular souvenir of Yurihonjō. A number of craftsmen in Yurihonjō produce traditional lacquerware. This is a traditional folk song, known as min'yō, which is reputed to be one of the most difficult for singers to master. A national Honjō Oiwake competition is held in Yurihonjō every year over 2 days in September. The foothills of Mount Chōkai produce many varieties of wild mountain vegetables and in spring and autumn it is common to see cars parked on the side of the road as people stop to pick them. Popular mountain vegetables are yamaudo (山ウド), bamboo shoots (笹タケノコ, sasa takenoko) and warabi (ワラビ). Natsuki Katō – model, actress and TV celebrity.